Things weren’t going particularly well for the Ohio State football team. They had given up a 12-play touchdown drive on Nebraska’s opening possession. Then they wasted a total gift of a botched kickoff by the Huskers and went 4-and-out the first time they had the ball. The crowd was dead, and the team was down. After the OSU defense stopped the Huskers on the ensuing drive, the Buckeyes needed someone to make a play. As Nebraska snapped it to punt the ball away, Keandre Jones raced untouched through the line. The protection wall in front of the punter was occupied with other rushers, and Jones raced past them. He was in so quickly, he practically took the ball off the punter’s foot. It ricocheted out the side of the end zone for a safety. Suddenly the crowd was alive and the Buckeyes were on the scoreboard. 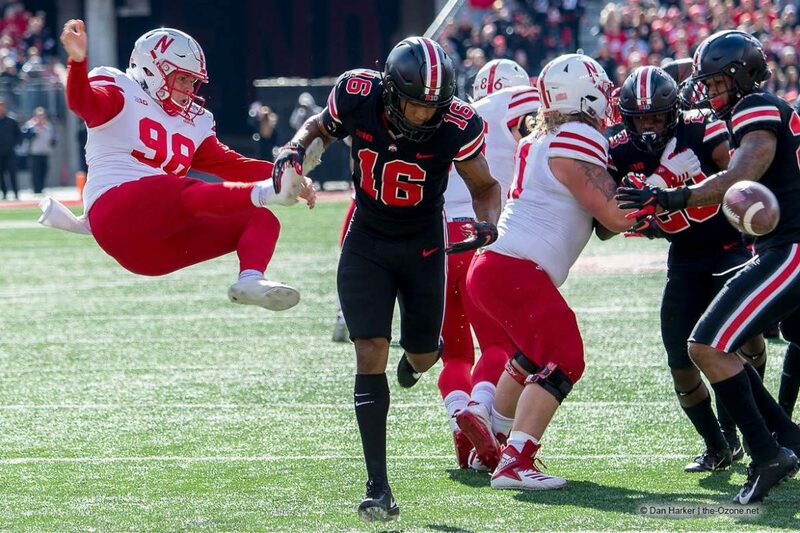 So what was Jones thinking as he raced untouched toward the Nebraska punter? “You’d better make that play,” he said with a laugh Wednesday night. The impact of that punt went well beyond the two points it netted the Buckeyes. It could earn Jones some more opportunities on defense as well. “That was obviously a big play, and that’s how you start earning the right to get more playing time,” said OSU head coach Urban Meyer. Jones played extensively at linebacker against Tulane, and got snaps against Oregon State and Rutgers as well. But he hasn’t cracked the lineup for more than a cameo since then. You might think that would be frustrating for a player like Jones, who came in with a 4-star pedigree as a recruit. “Not at all. Not when you’ve got guys like Pete Werner, Malik Harrison, and Tuf Borland, and my whole linebacker group. They’re keeping me in good spirits, working hard in practice, and the practice is going to translate to the game. I’m being patient and my time is going to come soon,” Jones said. He said that in addition to his work on special teams, he’s also trying to make an impact in other ways as well. “Staying positive, bringing a smile to everyone that I meet, keeping the young guys up, encouraging them to go hard, play hard, and just to be a leader for this team,” he said. Jones is trying to be a leader on the team, despite not being a regular on defense. “Just taking a leadership role in practice. When you do that, it’s going to translate into the game. Just keeping guys motivated and staying positive,” he said. It’s not hard to see how Jones might keep other players motivated. He hasn’t met with the media often during his career, but Wednesday night he was so enthusiastic that a reporter commented to him on his energy. Now he’s working to harness that energy elsewhere to hopefully earn more time on the field. You can watch Jones’ full interview below, and see interviews with other Buckeye players and coaches this week here. I was at a loss when Keandre Jones wasn’t starting beginning of the season. Showed flashes last year. Happy he’s being recognized, hopefully it translates to more playing time. The player personnel decisions are just shameful this year. Our players talk to recruits and recruits and their fathers & coaches are watching this… no wonder it could be Urban’s worst class thus far. In the last few years he has absolutely REFUSED to sit guys for poor performance, and his talk of not redshirting guys is a joke. The gig is about up. The shine is coming off. 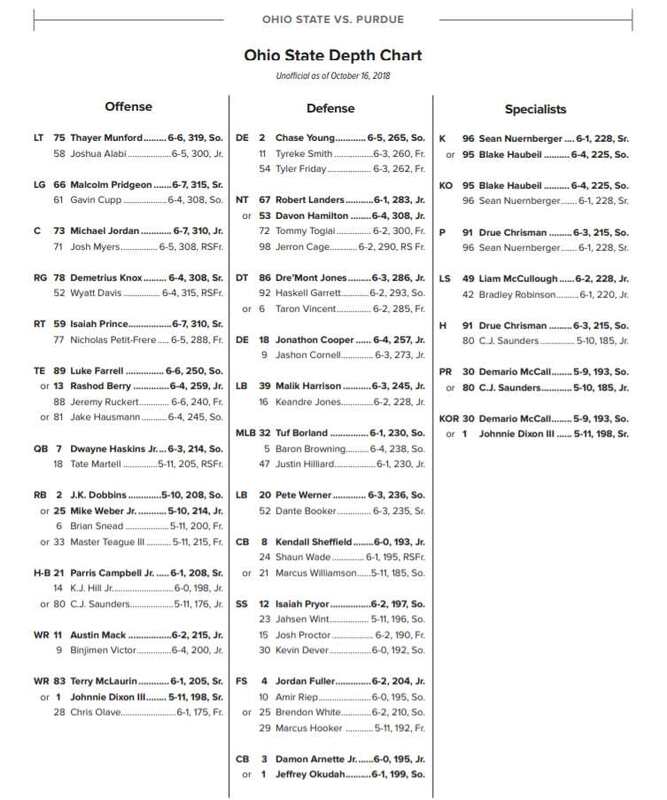 Urban can turn this around but it will take some serious changes…otherwise his mojo here will expire quick. Yet they play linebackers that whiff or can’t even miss tackles as they are too slow. Jones’ play was instrumental vs. Nebraska. Think it’s funny the Head Breakfast Coach says such a big play is “how you START earning the right to get more playing time”. So, the comment is qualified from the start. Then the comment clashes with earlier remarks that “how they play in practice” gets them more playing time. However, for giggles let’s just go with the HBC’s waffling pretzel logic. If it was true, how in the world do Werner and Borland keep getting so much playing time? What a joke.